As a child I remember a golden liquid that sparkled as sunlight penetrated the glass that housed it. This amber ambrosia, as I would later come to know it, held a certain magical quality in my home. It could make people laugh or dry tears on sad occasions. Children were not to touch it and women folk would shake their head as it was poured.Many a holiday as a young man I watched this magical amber elixir bring the men in my family from a handshake to a hug. This mysterious blend could turn a “how are you” to an “I love you” as I watched the Owens brothers reunite with their father, my grandfather, on many occasions. As a curious child my Dad would let me catch the aroma of the magical elixir. When my head snapped back from its aggressive scent I could hear my dad and my uncles chuckle. This comical performance would develop but not change much as they would watch me in my teens take a sip of a scotch and scrunch my face in disgust. Time passed on and I reached manhood, or so I thought. In my early twenties I could sit down with grandpa Pete and his sons with a cold beer in my hand. Yet still the amber potion was not within my reach. To pour me a glass of the elixir would be a waste. I knew nothing about scotch. The little contact I had with this liquid was sneaking shots of Dewars and Johnnie Walker from my Dad’s liquor cabinet with my buddies. We had no clue about what we were drinking; the history behind the bottle; or the delicate flavors that would rise from the glass. If by chance I got invited to partake in a glass of the good stuff, I was only getting one shot at it. The theory was the palette would be burnt on the first scotch so there was no need to drain a bottle of single malt. It was one good scotch then back to the store brand. Don’t think for a minute that I could sit down and polish off a good bottle of liquor. My uncle Dan attributes this theory to my Dad not grandpa Pete. In talking to uncle Dan, I figured out many of the Owens Scotch and liquor bylaws didn’t originate with grandpa Pete. Most of them were developed by his big brother, a.k.a. my dad. Uncle Dan was also quick to point out the life span of a bottle of Johnnie Red or Black was very long at my family gatherings. I was never around from cracked seal to dead bottle to see how long a bottle actually lasted however I do have a theory about how they were cracked. Grandpa Pete’s sons are very close; my dad Bruce Sr.; uncle Pete Jr. the salesman and uncle Dan the writer. These are three guys that know each other inside and out. So my theory is when a good bottle of scotch was about to get cracked there had to be a signal. There had to be some kind of a nod that I never picked up on. Three really close brothers don’t need to speak a word to communicate. The reason I believed this happened is because there was no announcement, “Hey we are going to crack a bottle of Johnnie Walker over here” or I would have heard it. Once in a while the Owens boys would get their dad a good bottle of scotch. Pete Sr. would have one drink with his sons and then leave it to them to finish off the bottle. This was not his brown goddess, his amber paradise. Pete was an old school guy that loved old school whiskey. This is a man that lived through the Great Depression so spending $30 – $50 dollars on a bottle of scotch was not the best use of cash in his opinion. Pete also lived through Prohibition. When he came into his own as a young man in his 20’s, the beer taps flowed once again and fires around the country started warming kettles of mash. Like many men of his generation he developed a taste for Canadian Whiskies during the ban of alcohol in the US. This preference for Whiskies from the north would dominate the US markets for many years. As I said previously I was in my early twenties happy enough with my cold beer being allowed to drink with Pete, Dad and my uncles. Years later I bypassed my Dad and uncles and went right to the source and started drinking whiskey with Pete. To amplify how precious this nectar could be considered allow me convey a story. I was around 25 years old and bumped into Pete at the local waterhole. He was doing his “daily errands”. Feeling all grown I pulled up a barstool next to Pete and ordered a drink for my Grandfather and myself. The bartender cleared the empty glass from Pete, replacing it with a fresh scotch and brought me a drink. This pissed Pete off to no end! Pete’s glass was bone dry but he said, “There was still flavor on that ice,” and the bartender should have simply topped off the glass. Wait a minute didn’t I pay for the scotch! Didn’t matter; the ‘good liquor” was not to be wasted. That day the bartender was not handsomely tipped. The 50 cents that Pete would leave daily was not left on the bar that day. Seeing the bartender was one of my buddies I took care of him on the sly. I cherish my days with Pete but he has been gone for many a year. Seeing I no longer had Pete to further my education of the brown goddess I did what we always do here at TheManRoom and went right to the source. I got an education in scotch appreciation from Bradley Jarvis, Master of Scotch. He is Brand Ambassador for Johnnie Walker Blended Scotch Whiskies, The Classic Malts of Scotland, The Hidden Malts and Buchanan’s Blended Scotch Whiskies. 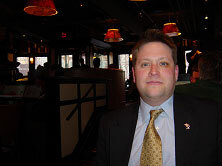 I Meet Bradley in Harvard Square at the Grafton Street Pub. The name of this restaurant was not at all familiar. I know Cambridge like the back of my hand and I never heard of this place. Bradley would have removed all of the mystery if he had told me it was the old Bow & Arrow. Ironically if he told me to meet him at the Bow & Arrow I probably wouldn’t have shown up. 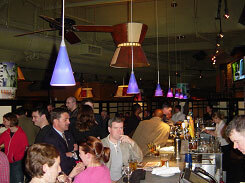 The Bow & Arrow was one of the biggest dive bars in Cambridge MA, maybe even of all of Boston proper. This cavernous crap hole of lukewarm yellow fizzy swill and hot dogs cooking under the power of flood lights was actually the set for the bar scenes in the movie Good Will Hunting. Someone with a bit of style and flair got a hold of this place, sandblasted 50 years of wear and tear and turned it in to one of the coolest bars in Cambridge with a beer and scotch menu that is mind blowing. The hot dogs on a rotisserie have been replaced with an awesome Irish influenced menu and the homeless patrons replaced by a classic eclectic Cambridge crowd less Minnie Driver and Matt Damon. So I sat down in this newly renovated watering hole with Bradley and got down to business. TMR: Seeing that I am a beer guy how do I make the leap from beer to fine scotches? I do drink scotch now and like the smoky peaty ones. What I would like to find out is how do I identify the different aromas and flavors going on in the glass? BJ: Beer and scotch are very similar when it comes to the ingredients grains, water and yeast. The big difference is scotches have no hops. TMR: So walk us through the process. How is scotch made? BJ: It begins with Malting. Malting is the controlled germination of barley that will yield a high content of starch that in turn, will be converted into a fermentable sugar. The barley is first steeped in water for 2 days to promote germination. After steeping, the germination will continue for another 5-6 days. During this time the grain will be turned and saturated at regular intervals to stop the grain from drying out. TMR: I can imagine different grains lend different characters and flavors to the finished product. Where do those peat flavors I love come from? BJ: The malt is dried over a peat fired kiln to arrest the conversion process and allow the malt to keep its quality until it is required for mashing. The peat smoke impregnates the malt and that distinctive peaty flavor is noticeable in the final character of many single malts, especially the Islay malts. TMR: This is where I need a little help. What is an Islay malt? How do I tell the difference between a Highland, Lowland and Islay? BJ: It is fairly simple to identify the different regions. Lets sample an Islay whiskey Caol Ila. It will be a great example. TMR: That’s what I am here for – let’s do this. When sampling beer I first check the color then the aroma then on to the mouthfeel and the initial flavors followed by of course the finish. Do you use the same procedure in tasting scotch? BJ: The process is very similar but we are going to taste the whiskey twice. Once neat and once with just a slight splash of water. Just enough water so that you can see threads develop in the glass. It breaks down the ester chains. It is very hard to taste 80 proof alcohol. The water will also open up the aroma for us a bit and ease the palette a bit. TMR: With beer I know that there are certain aromas that I am looking for to tip me off to what the style of beer is. Should I be looking for any particular aromas in an Islay whiskey? BJ: Islay is an island off of the south west coast of Ireland; you will pick up aromas of salt water in the Islay whiskey. TMR: (I closed my eyes and really concentrated on the aroma and as Bradley noted I could smell the ocean!) This is really cool. It is like this bottle brought the seacoast of Ireland to the shores of America. There is also a lot of peat in the aroma. I am loving this. What about the color? Tell me a little bit about how that is developed. BJ: The color is developed in a few different stages of the distilling process. Of course different grains will enliven the color. The color is also affected by the distilling process. The vessels themselves will affect the color depending on how hard they are worked and will make the final product darker or lighter. The aging also has a huge bearing on the color of the whiskey. If it is aged in oak or bourbon barrels it will most likely have a yellow color. If it is aged in sherry barrels it will have a red to amber color. Most single malts are aged in oak barrels but you will find some single malts with a Sherry finish. TMR: That brings me to my next question. I know what single malt is and a blend but I keep hearing about pure malts. What are those? BJ: A pure malt is a blend of only single malts whereas blended scotch whiskey will have other whiskies blended in it. Rye is commonly used in blends. TMR: So if you have these great single malts what is the purpose of blending them all together? BJ: The distilleries started blending their products originally because they didn’t have enough whiskey to send to bottling. By combining their products, they would have enough to make it worthwhile to bottle and distribute. In doing this they found that a lot of different whiskies complimented each other wonderfully. TMR: So is this something that you would do at home? Take a couple of single malts and try to make a blend? TMR: What was that you ordered? 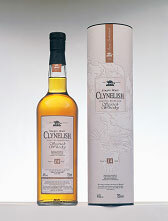 BJ: Clynelish; it is a great example of a highland whiskey. 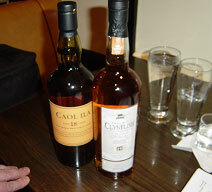 TMR: What is the big difference between the Islay we just had and a highland? BJ: The highland distillers moved to the highlands originally to avoid the taxmen. TMR: I like these guys already. What are the characteristics of a highland whiskey? TMR: I want to get back to the distilling process a little more. How do we go from a thick mash to this fine golden liquid? BJ: After the mash the “grist” is put in large wooden drums or “wash-backs”. Yeast is added to the sugary liquid and allowed to ferment for at least 48 hours. When all the sugar has been exhausted the yeast will die. The alcohol content of the liquid now called “wash” reaches about 8% of alcohol by volume. TMR: That is the ABV of a pretty strong beer! But of course whiskey guys aren’t going to stop at 8% ABV. What happens next? BJ: Distillation takes place twice in large onion shaped copper vessels with long swan like necks called “stills”. It separates the alcohol from the wash by turning the wash into a vapor. Because alcohol boils at a lower temperature than water, the distiller’s art is to extract the alcohol from the wash by alternating the heat. The vapor then travels through a condenser carrying with it the complex flavors from the “still”. After the first distillation, the “still” produces a solution called “low wines”, which is around 20% vol. of alcohol. The waste from the first distillation is again recycled into animal feed and the low wines are distilled for a second time. TMR: So there is a second distillation of the product. This must be a pretty complex process. BJ: The second distillation is most crucial for the distiller – he must separate the middle part from the first liquid collected, “fore-shots”, and the last liquid collected, “feints”. If this is not done, the “new-make spirit” will be either too harsh, or contain too many aromatics. TMR: Are there any other ingredients that would go into a whiskey? Will distillers add anything off the beaten path to the recipe? BJ: There are a couple of distillers that are experimenting with different spices but that is widely frowned on. A lot of purists don’t even consider it scotch. There are purity laws in Ireland very similar to the Reinheitsgebot brewing purity laws in Bavaria. Water, grain and yeast are what go into whiskey nothing else. So how are you feeling, do you think you are ready for one more? TMR: I was anticipating this so I ate a huge burger at the bar while I was waiting for you. I am feeling fine. BJ: Smart move. Tasting scotch is fun but you have to be very responsible in doing so. Getting a good food base in you is a good start, pacing yourself is also very important. TMR: So what is up next? I know in tasting beers we would start with the milder ones first and head up the food chain to the more aggressive beers. Is that what we are doing here? TMR: What makes this whiskey so special? BJ: Talisker is the only distillery on The Isle of Skye. You mentioned you like smoky, peaty flavor I have a feeling you will really like this whiskey. TMR: Wow! This is fantastic. I almost feel like I am drinking smoked wood. This is very earthy and the flavor is very bold. BJ: I am glad you like it as it is one of my favorites. It is one of the blends used in making Johnnie Walker Green as is Caol Ila. TMR: Well we all truly appreciate your time and seeing the wide range of products your company produces I am sure that we will be talking to you again. Usually I close the column with 4 picks but seeing that scotch is a little more potent than beer I think I will send my readers in pursuit of one bottle for now. Johnnie Walker Green: To collect all of the fine whiskies that go into making Johnnie Walker Green you might need a bank loan. That being said you might want to pick up the single malts that make up this whiskey a bottle at a time. While you are building your collections of single malts so you can do your home blending. Johnnie Walker Green is a great pure malt already blended for you.